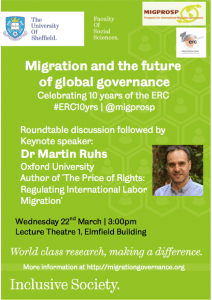 The ERC funded project Prospects for International Migration Governance (MIGPROSP), in collaboration with Migration Research at The University of Sheffield Migration Research at Sheffield Group, invite you to celebrate the 10th years of the European Research Council with an afternoon-long event discussing migration governance. We are pleased to host Dr Martin Ruhs, Associated Professor Political Economy at Oxford University and Author of ‘The Price of Rights: Regulating International Labor Migration’ as our keynote speaker. Dr Ruhs will be discussing the paper titled “Labour immigration policies in high-income countries: Variations across political regimes and varieties of capitalism”. This keynote lecture will be preceded by a roundtable discussion around the emerging findings of the MIGPROSP project. The roundtable, led by Professor Andrew Geddes, will include MIGPROSP’s members Co-investigator Professor Nicola Phillips, Research Associate Dr Marcia Vera Espinoza and PhD Researchers Michaela Bruckmayer, Luca Lixi, Laura Foley and Andrea Pettrachin.